100 years of “The Mark on the Wall” – Virginia Woolf’s groundbreaking story inspired Stepha Schweiger to compose a musical theatre to be premiered in Bloomsbury. Split into 3 roles – singer, dancer and speaker – the protagonist embarks on a phantasmal journey between imagination and reality. It is exactly 100 years since The Mark on the Wall was written, Virginia Woolf’s groundbreaking story. This has inspired Stepha Schweiger to compose a work which is being premiered 2017 in London as part of the Tête à Tête Opera Festival. It will then be performed at the Acker Stadt Palast in Berlin. In The Mark on the Wall the narrator’s gaze is drawn to a stain, which makes the mind spin and consequently the imagination begins to run wild. Split into three roles – singer, dancer and speaker – the protagonist in this work embarks on a phantasmal journey between imagination and reality… Written during the First World War The Mark on the Wall contains topics that are still relevant again today: equal rights, ideas about safety, standards, nature and many other subjects will be questioned in the maelstrom of events through the music. from Tête à Tête on Vimeo. Stepha Schweiger started making music as a child also so discovered her passion for performance, audio recordings and microtonal deviations. She studied composition under Walter Zimmermann and Gösta Neuwirth at the University of the Arts in Berlin and concluded the course with the accolade „Meisterschüler“(master-class student). She was also tutored by Helmut Lachenmann and Barbara Monk Feldman. She studied experimental music under Dieter Schnebel, piano under Cristian Petrescu, and electronic music during her year-long course at the IRCAM in Paris and at the Institute of Sonology at the Royal Conservatoire in The Hague. Currently, she teaches music and also acts as a mentor in institutions such as the Institut für Neue Musik in Berlin and at the Hochschule für Musik Hanns Eisler in Berlin (Modern-Day Composing series; mentor for a thesis about Tristan Murail), at the Kunsthochschule für Medien in Cologne (Golden Chords – My Microtonal Composing, Microtonal Projects), and the University of New Mexico, Albuquerque, USA (Composers’ Symposium). She has produced specially commissioned works, including the full-length experimental musical theatre work she created for the Berlin Senate. Her works are regularly performed throughout Europe, and in the USA and Brazil. Anna Clementi studied flute, drama and singing in Rome before she transferred to the Berlin University of the Arts in 1986 where she met the composer Dieter Schnebel. Ever since, she has often worked with the “Die Maulwerker” ensemble, which was founded by Schnebel. Anna Clementi’s repertoire stretches from contemporary acoustic works and music theatre to electroacoustic and club music. 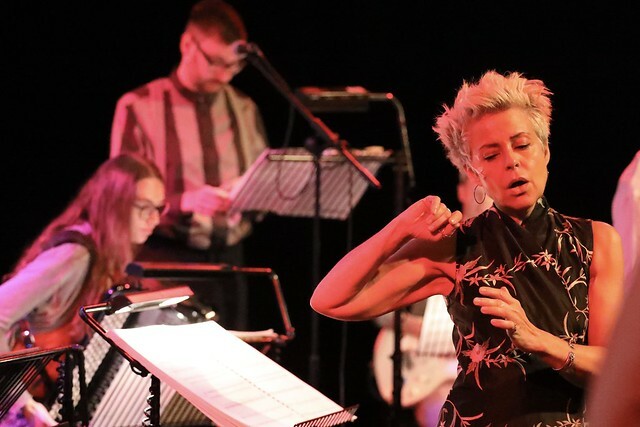 One of her key focus involves the work of John Cage, as this gives her the opportunity to explore the relationship between vocals, language, gestures and theatre. Leo Chadburn is a composer and performer of experimental and electronic music, ‘avant-pop’ and music for the gallery. His most recent works are preoccupied with the ideas of ‘found text’ and the musicality of speaking voices, including The Indistinguishables (2014) for Quatour Bozzini, Affix Stamp Here (2016) for EXAUDI and Freezywater (2016) for Apartment House, which won a 2016 BASCA British Composer Award. As a vocalist, he has performed works by composers including Jennifer Walshe, Gavin Bryars, Frederic Rzewski and Peter Ablinger. He has presented his own work internationally, under his own name and the pseudonym Simon Bookish, in works such as RED & BLUE (2015), a solo performance based on the Cold War correspondence between Margaret Thatcher and Ronald Reagan. His collaborative work includes projects with visual artists including Jennet Thomas (The Unspeakable Freedom Device, 2015) and Cerith Wyn Evans (Imagination Dead Imagine, 2013). His discography includes four solo albums besides remixes for Owen Pallett, Grizzly Bear and Seb Rochford. His music has been broadcast on BBC Radio 1, 3 and 6 Music and his writing has appeared in publications including the Wire, the Quietus and Frieze. Ziv Frenkel grew up in Israel, and currently lives in Berlin. He has performed with: 1999 – 2008 Volksbühne Berlin and Theater Bonn under the artistic guidance of Johann Kresnik ChoreographicTheatre, 1995 – 1999 Bremer Tanztheater under the artistic guidance of Susanne Linke, 1988 –1995 Kibbutz Contemporary Dance Company, Israel under the artistic guidance of Yehudit Arnon. He has also worked with numerous European artists, choreographers and directors. He has created his own dance and theatre productions and has been a freelance artist since 2008. Christian Vogel was born in Landau/Pfalz, Germany and is a founding member of the ensemble mosaik. He studied clarinet with Peter Rieckhoff, Ewald Koch and François Benda at the University of Arts in Berlin. Vogel has performed with the Deutsche Kammerphilharmonie Bremen, the Berlin Radio Symphony Orchestra, the Neubrandenburg Philharmonic and many other orchestras and has played solo concerts, amongst others, with Deutsches Kammerorchester Berlin. During his studies, his main interest was in contemporary music and the challenges the interpreter has to face. In addition to his involvement with mosaik, he has also played also with the modern art sextet, the ensemble unitedberlin and ENSEMBLE 21, amongst others. His artistic work is also however very much dedicated to musical theatre, as a multi-instrumentalist, playing not only the clarinet but also the saxophone and the flute on a regular basis at the Neuköllner Oper and with the ensembles of musicals in Berlin, Hamburg and Stuttgart – as well as puppet theatre where he is instrumentalist for the ensemble Hans-Wurst-Nachfahren. in Berlin. For the Eurhythmics-Ensemble Berlin he composed and produced the music for the fairy tales Das Waldhaus and Babajaga. With the ensemble mosaik, Christian Vogel has given guest performances at a wide range of key international festivals for contemporary music and has also contributed to broadcasting recordings and CD productions. Silke Lange is one of the most outstanding accordionists in Germany. She studied at the Hochschule für Musik Hanns Eisler Berlin. The focus of her musical interest is New Music. She has performed at,amongst others, the festival for New Music Ultraschall and at MaerzMusik in Berlin, at the Internationale Ferienkurse für Neue Musik in Darmstadt, at the MoselMusikfestival, the Oberstdorfer Musiksommer, the Festival Mitte Europa as well as at Young Euro Classic. Together with saxophonist Ruth Velten she co-founded the ensemble for contemporary music LUX:NM Berlin and performs together with trombonist Florian Juncker in the Duo LangeJuncker. She regularly appears in theatre productions and works together with international performance collectives (e.g.Deutsches Theater Berlin, Staatsoper Berlin, HAU, Künstlergruppe »club real«, Schauplatz International,Staatsoper Hamburg, Staatstheater Mainz, Duo Randgruppe,Berliner Festspiele). Johannes Öllinger is a Munich-based guitarist plays as a soloist as well as with duo partners, ensembles or orchestras – from old music on original and modern instruments, over the classical guitar repertoire, to contemporary music of every kind. His main instruments are the classical and the electric guitar, besides banjo, theorbo and bass. He also performs in theatre projects.As a soloist he has performed at the Salzburger Festspiele, the Konzerthaus Wien, the Laeiszhalle Hamburg and the Prinzregententheater München amongst others. His guitar duo steuber.öllinger has a focus on contemporary music and was invited to festivals in Germany, Poland and the U.S. Johannes frequently plays with ensembles like Resonanz, Ascolta, musikFabrik NRW, the ensemble modern orchestra, Staatsorchester Stuttgart and the BR Symphony Orchestra. He has worked with composers such as Helmut Oehring, Klaus Schedl, Georges Lentz, Tom Sora, Helmut Lachenmann and conductors Peter Eötvös, Johannes Kalitzke, Christoph Altstaedt, Titus Engel, among others. Since 2005 he has worked with director Andreas Bode in music theatre productions like Don Giovanni, L´Orfeo, Mozart Requiem, Tosca Variation, Miss Elvira, Wer nicht arbeitet soll auch nicht essen, presented at Kampnagel and opera stabile Hamburg, Radialsystem Berlin, Tanzhaus Düsseldorf and Theater an der Wien. He also worked with directors Anna Malunat (Postcards from the furure, FFT Düsseldorf 2013) and Florentine Klepper (Telemann Orpheus, Oper Frankfurt 2014). Together with soprano singer Catrin Kirchner he developed the staged recital datingORFEO with songs and arias in his own arrangements in 2013 and performed Georges Lentz´ one hour electric guitar solo INGWE in Schwere Reiter München as a German premiere in the same year. Johannes studied classical guitar in Berlin and Würzburg with Daniel Göritz and Jürgen Ruck. He has won prizes including Jugend Musiziert 2000, IV. Concorso Internationale Ruggero Chiesa 2008, IFNM Darmstadt 2008, the Leonhard und Ida Wolf Gedächtnispreis 2012 with duo steuber.öllinger, and the munich scolarship for music 2015. Antonis Anissegos has been based in Berlin since 1998 and works as a composer, pianist (interpreter/improviser) and electronic musician (alias “unu”). His current projects include: Trio IAMA (with Jannis Anissegos, Maria Anissegou), Grix (with Floros Floridis, Yorgos Dimitriadis), ΣΩΜΑ (with Thymios Atzakas), best before unu (with bestbefore), ddaA (with Oliver Steidle) and Card Castle (with Mike Majkowski, Christian Marien). His solo, chamber, orchestral and theatrical music compositions have been performed by Ensemble Modern, Ensemble Mosaik, Ensemble Cornucopia, Ensemble Piandaemonium, Ensemble DissonArt, State Orchester of Thessaloniki, Colour Orchester of Athens and Youth Orchester of Thüringen. He features on over 40 recordings mainly in the field of contemporary creative music. consideration of the particular space and context in which the music is taking place. Florian Tippe was born in Berlin and studied classical music at the University of the Arts Berlin and jazz and free improvisation at the Royal Welsh College of Music and Drama, Cardiff. As a composer and sound designer he frequently blurs the lines between sound and music and has worked in fields as diverse as dance, theatre, film and art installations. He produced film music for German public broadcasters and X-Filme Berlin and worked with theatre director Nurkan Erpulat, film director Ayse Polat, dance choreographers Helge Letonja and Simone Sandroni and visual artists Simon Faithfull and Nevin Aladag. Jürgen Groezinger lives and works in Berlin, although was born in Ulm, southern Germany. He demonstrated a keen passion and interest in classical music at an early age but also many other diverse types of music. His earliest experience of being on stage was as a drummer in a youth wind ensemble as well as with an amateur symphony orchestra. He studied music in Munich and Stuttgart, his main subject being classical percussion. From an early stage he has been instrumental in setting up innovative projects and his own ensembles, with the aim to break down and transcend the boundaries between composed music, improvisation, classical venues and the club scene. For more than 10 years now he has been the artistic director of a contemporary music festival in Ulm. He also leads the prestigious ensemble the ‘European Music Project. Its repertoire ranges from classical modern music to contemporary works, but also draws inspiration from world music as well as the electronic music associated with contemporary cclub culture. Jürgen has also made a name for himself as a DJ in which guise he has ‘dj’ed’ in many internationally renowned Berlin clubs. Miriam Götting was born in Berlin. She studied with Jaap Zeijl in Hanover and Professor Jürgen Kussmaul in Dusseldorf. Her musical interest encompasses contemporary music as well as chamber works. She was a member of the highly acclaimed Athena string quartet until it disbanded in 2012. She has also been solo violist for the string chamber ensemble Resonanz. She has also worked with the Ensemble Modern, die musikfabrik, ensemble chaosma, and Jürgen Grözinger and European Musicproject. She lives with her family in Berlin. (supported by the Federal Association of Fringe Theatre and Danceperformers in Baden-Württemberg with funds of the Federal Ministry of Science, Research and Art in Baden-Württemberg). To keep up to date with all the latest on Tête à Tête: The Opera Festival 2017 sign up to our mailing list on our homepage.